Make sure you test the Bluetooth interface that's offered on the Elantra—ideally at highway speeds—before you commit to it; you might be better off with an aftermarket solution in this case. The 2010 Hyundai Elantra remains a perfectly competent and spacious—if slightly boring—sedan, while the Touring wagon gets a more exciting personality. 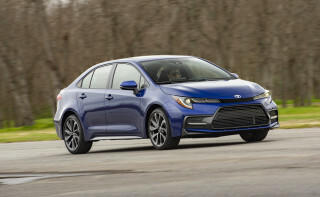 TheCarConnection.com's experts have driven the Elantra and bring their firsthand driving impressions to this Bottom Line. But that’s not all; it’s coordinated with a full review of the 2010 Hyundai Elantra, with expert-gathered information from other sources. The 2010 Hyundai Elantra includes both sedan models and the sportier Touring wagon; size-wise, they slot between the bargain-basement Rio and the mid-level Sonata. For 2007, the Elantra was redesigned and became significantly larger all around; as it is, the Elantra qualifies as a mid-size car by some numbers. Last year, the five-door Elantra Touring wagon joined the lineup. With a sportier appearance inside and out and a more premium European-influenced look and feel, the Touring almost comes across like a different vehicle from the sum of its details, even though its powertrain and basic platform are the same. Matching Hyundai's other vehicles, the interior follows a soft—not edgy—design, with rounded borders and flowing curves. Across the model line, a 138-horsepower, 2.0-liter four-cylinder engine is quite gutsy whether you choose the automatic transmission or the five-speed manual. Although the engine is smooth and quiet for most driving, it’s a bit loud and boomy—and not in a sporty way—when accelerating hard. Overall, the Elantra is quite softly sprung, which allows it to soak up bumps very well, with the ride quality of a larger sedan; Elantra Touring models get a different calibration, along with bigger stabilizer bars, with a much sportier feel overall. On either model, the electric power steering system in the Elantra works very well, light at low speed and firm yet responsive at high speed. Through some relatively simple engineering enhancements—such as a smart alternator, lower-friction components, and revised/taller gear ratios, along with revised engine calibration—Hyundai has improved fuel efficiency on the Elantra Blue base model by up to 8 percent versus last year. EPA ratings now stand at 26 mpg city, 35 highway with the standard five-speed manual transmission—up from 24 mpg city, 33 highway on last year’s model. On other Elantra GLS and SE models, fuel economy ratings have gone up about 1 mpg in both city and highway ratings, to 26/34 mpg. Interior space is a strength in the 2010 Hyundai Elantra no matter which model you go with. Seating in front is generously proportioned and comfortable, and there's enough headroom and legroom in back for two—or, in a pinch, three—normal-size adults, which is unusual among small sedans. With 97.9 cubic feet of passenger room and 14.2 cubic feet of trunk space, it has the most interior volume for a sedan in its class—and could almost be called a mid-size car. Touring models have a high roofline, which allows them almost SUV-like utility and versatility, and the split backseat folds forward flat. It’s a neat, well-designed layout. Switchgear and gauges in the Elantra are straightforward and tactile, and the instrument panel's design, with the high-mounted sound and climate-control functions, is convenient. With very little road and wind noise to speak of, it’s also one of the quietest cabins in its class. Crash-test ratings for the 2010 Hyundai Elantra are just acceptable, with mostly five-star ratings in federal tests but four stars for side impact. The IIHS gives it "acceptable" ratings for rear impact and a "marginal" rating for side impact. Front, side, and curtain airbags are standard across the Elantra lineup, as are anti-lock brakes and active head restraints. Stability control and brake assist are standard on the SE and included on Touring models. Offered for the sedan—but not the Touring wagon—is a new, fuel-economy-optimized Elantra Blue model. The base Blue includes power heated mirrors, power locks and windows, keyless entry, a split-folding rear seatback, and a tilt (though not telescopic) steering wheel. Options include air conditioning, an upgraded 172-watt audio system with MP3 compatibility, iPod and USB inputs, and cruise control. In short, it's a gas-saver but not a blue-light special. The GLS moves a bit upscale from last year, adding most of those options plus a few more minor features, such as fog lamps, while the top-of-the-line SE includes steering-wheel audio controls, leather trim, telescopic steering-wheel adjustment, sport-tuned steering and suspension, and 16-inch alloy wheels. At the top of the range you can get a sunroof and heated seats. Bluetooth is offered only as a port-installed option, and it's a mediocre headliner-speaker system rather than integrated with the audio system. The 2010 Hyundai Elantra sedan comes across as inoffensive, but the Touring is a little more distinctive. 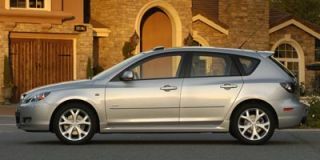 The 2010 Hyundai Elantra sedan isn’t much of a looker from the outside, though the Elantra Touring wagon seems to impress reviewers a bit more. Matching Hyundai's other vehicles, the interior follows a soft—not edgy—design, with rounded borders and flowing curves. ConsumerGuide likes the "large, clear gauges" and explains that "climate and audio controls are simple and handy." Edmunds notes that the Hyundai's "interior quality is quite literally hit or miss," although "the overall design is attractive and pleasing, looking as if it belongs in a much more expensive car." ConsumerGuide concurs, reporting that "plush cloth upholstery, attractive plastics, and many soft-touch surfaces belie Elantra's pricing. So does its classy blue dashboard lighting." Kelley Blue Book says the Elantra is "not necessarily an example of modern style," criticizing "the SE's somewhat dated-looking velvety seat fabric, the instrument panel with its expanses of plastic and the over-designed door panels [which] appear a little old-fashioned." Motor Trend offers a comparison to airline travel and proposes that the Touring model “symbolizes the economy-plus ticket,” especially inside. Performance clearly isn't a priority for the 2010 Hyundai Elantra, but it offers a good compromise to include comfort and fuel economy; enthusiasts might be a little happier with the sporty Touring wagon. Whether you choose the automatic transmission or the five-speed manual transmission, a 138-horsepower, 2.0-liter four-cylinder engine is quite gutsy. Most reviewers agree that the Elantra has enough power with its fuel efficiency, though when you tap into the engine's reserves, it's accompanied by more noise than might be expected. Cars.com notes that "getting up to highway speeds requires revving the engine high, creating enough noise to drown out the stereo." The reviewer adds, "passing at highway speeds requires a downshift or two," and "even then it takes patience and timing." 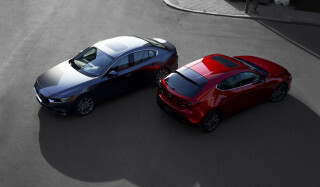 ConsumerGuide reports that "acceleration in the sedan is adequate with either transmission, but it's far from snappy." 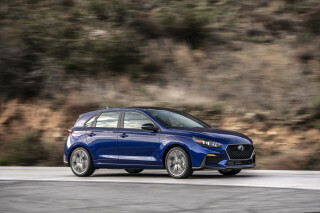 Edmunds says, "Elantra's 2.0-liter four-cylinder engine is an old design and isn't as refined as those found in its Japanese competitors," according to Edmunds, although they add that "it's surprisingly responsive and returns pretty good fuel economy." The transmission offerings—a five-speed manual or four-speed automatic—are typical for this class. Edmunds reports, "All trim levels can be equipped with either a five-speed manual or a four-speed automatic." ConsumerGuide asserts that "the automatic transmission is smooth and responsive." Kelley Blue Book says that the manual gearbox isn't very smooth, so you "may not like this car if your daily drive demands constant gear shifting." Hyundai improves fuel efficiency on the Elantra Blue base model by up to 8 percent versus last year. EPA ratings now stand at 26 mpg city, 35 highway with the standard five-speed manual transmission—up from 24 mpg city, 33 highway on last year’s model. On other Elantra GLS and SE models, fuel economy ratings have gone up about 1 mpg in both city and highway ratings, to 26/34 mpg. Overall, the Elantra is quite softly sprung, which allows it to soak up bumps very well, with the ride quality of a larger sedan; Elantra Touring models get a different calibration, along with bigger stabilizer bars, and a much sportier feel overall. On either model, the electric power steering system in the 2010 Elantra works very well, light at low speed and firm yet responsive at high speed. According to ConsumerGuide, the Elantra's "electric power steering is quick but feels a tad light." The Washington Post contends that "handling was sure, albeit lacking the precision that some throttle jockeys demand in everything." ConsumerGuide reports that "the suspension allows some cornering lean, but the tires furnish good dry-road grip." 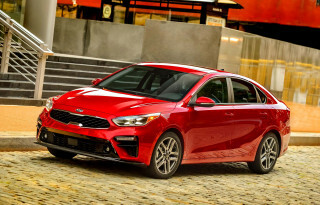 Overall, Kelley Blue Book judges the sedan to be "a comfortable car to drive...secure and reliable," opining that "owners will likely appreciate its straight-forward predictability and control." “The Elantra Touring is very much a direct port of the i30 and actually has little in common with the four-door Elantra sedan, save for its 2.0-liter four-cylinder engine and transmission choices,” Autoblog says. Motor Trend also points out the similarities to the Euro-market Hyundai and describes the ride as firmer. "Handling dynamics are generally crisp," Motor Trend reports, although they mention "somewhat numb steering." Car and Driver is also impressed with the overall feel of the Touring model, attesting, “The Touring edition has pleasant road manners, good steering feel, adequate power, respectable grip, and forward sightlines worthy of a Honda.” But “the chassis feels a little flexy when pressed, and the suspension runs out of travel on rough roads,” the reviewer warns. The 2010 Hyundai Elantra might not be the most refined car in its class, but there's an abundance of interior space and materials are pleasant, especially in the Touring. No matter which 2010 Hyundai Elantra model you go with, interior space is a strength. 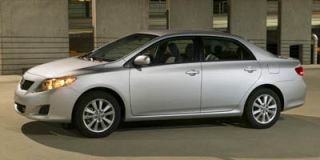 The sedan actually qualifies as a mid-size car by some, and interior materials and trims are impressive for the price. Touring models have a high roofline, which allows them almost SUV-like utility and versatility, and the split backseat folds forward flat. It’s a neat, well-designed layout. Switchgear and gauges in the Elantra are straightforward and tactile, and the instrument panel's design, with the high-mounted sound and climate-control functions, is convenient. With very little road and wind noise to speak of, it’s also one of the quietest cabins in its class. Seating in front is generously proportioned and comfortable, and there's enough headroom and legroom in back for two—or, in a pinch, three—normal-size adults, which is unusual among small sedans. With 97.9 cubic feet of passenger room and 14.2 cubic feet of trunk space, it has the most interior volume for a sedan in its class. Edmunds contends that adults will "appreciate the Elantra's generous amount of space provided by the generous head, shoulder, hip and legroom found in both the front and rear seats." ConsumerGuide points out "adequate headroom and legroom, though taller occupants may want more room...wide ranging seat and steering wheel adjustments [that] enhance driver comfort." Cars.com reports the Elantra's "cloth seats are comfortable, with substantial cushions and ample back support"; however, the Hyundai Elantra loses a point because "lumbar adjustment for the driver's seat is not available." Kelley Blue Book says, "Elantra can comfortably and safely pack in a family of five and its cargo." MotherProof pipes up, "I'm going out on a limb here to let you know that the Hyundai Elantra is downright and surprisingly roomy," while ConsumerGuide reports that the back row has "adult-size room." Cars.com is the odd one out, remarking that in back "the seats are high enough off the ground that legroom is bearable, but headroom is tight." Trunk space in the sedan is very impressive, too. According to Cars.com, the "seatback folds in a 60/40 split, exposing a small opening to the trunk," which measures 14.2 cubic feet—"more than nearly all the Elantra's major competitors." ConsumerGuide reports "more trunk space than many cars in this class," but notes "the slim opening and sickle-type trunk lid hinges compromise utility." And there's definitely enough space for the small items—Edmunds observes "plenty of cubbies," and MotherProof cites "all the wonderful consoles and storage for the driver and front passenger" and points out a "lidded compartment on top of the dashboard perfect for pens, paper, snacks, and cell phones." Most reviewers are impressed with the materials in the 2010 Hyundai Elantra, which seem a little more upscale than other cars in its class. Cars.com suggests, "Beyond some cheap door panels and a rubbery steering wheel, there was little to suggest the [Hyundai] Elantra as tested cost less than $16,000...the dash is trimmed in soft-touch materials, the buttons feel high-quality and the ceiling has an upscale woven texture." Edmunds, however, is less complimentary about the Hyundai Elantra's "likable interior," saying it's "betrayed by some cheap plastics here and there." The 2010 Hyundai Elantra feels quite refined for small cars, but reviewers are split on just how much. Cars.com reports, "wheels and suspension provide little in the way of sound deadening, so there's plenty of road noise at highway speeds." ConsumerGuide remarks that the "engine is a bit noisy at high rpm but is never unpleasant," while noting "some wind rush...evident around the exterior mirrors." They also conclude that "road and tire noise are impressively low for the class." Edmunds sings the praises of the Elantra's ride, which "continues to impress, with decent steering and handling responses, as well as a smooth ride and a stable demeanor at high speeds." The 2010 Hyundai Elantra fails to wow, with a decent seat of features but only so-so crash test scores. The Elantra sedan earns an "acceptable" rating for rear impact from the Insurance Institute for Highway Safety (IIHS), but just "marginal" in side impact. It also gets a mid-pack four stars for side impact in the National Highway Traffic Safety Administration (NHTSA) crash tests. It gets top frontal impact scores from both tests, though. 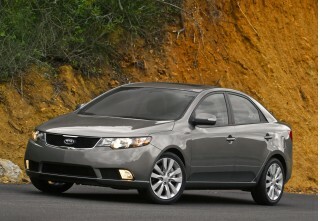 The 2010 Elantra lineup includes side and curtain airbags, as virtually all small car models now do. MotherProof points out "six standard airbags in the Elantra, including side-curtain airbags for the back seat." Also standard are anti-lock brakes and active head restraints; stability control and brake assist are standard on the SE for the new model year as well. Relevant to busy parents, MotherProof says that "three car seats will not fit in the back seat ... so take note of the fact that while the Elantra has the most interior space in its class, it's still not a school bus." On the Elantra sedan, visibility looks to be an issue. "The back shelf comes up so high it's difficult to see out the rear window," comments MotherProof. "It would seem odd to wish for a backup camera in a small budget car, but I do with the Elantra." Kelley Blue Book also reports that "visibility is slightly hampered aft and to right rear." The 2010 Hyundai Elantra comes well equipped, but it's missing some tech-savvy essentials like a well-integrated Bluetooth interface. 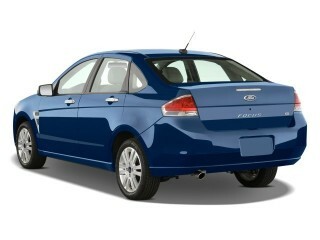 The Hyundai Elantra lineup has been reconfigured a bit for 2010 with the introduction of a new base Elantra Blue model. Formerly base GLS models have moved more upmarket, while the sportier top of the range is still the Elantra SE. ConsumerGuide proclaims that "a robust feel, attractive prices and Hyundai's strong warranty also make Elantra a recommended pick." MotherProof cuts right to the chase and explains, "What strikes me about the Elantra is the fact that I never say to myself, 'I wish it had ...' I don't miss anything that isn't already there." The base Blue includes power heated mirrors, power locks and windows, keyless entry, a split-folding rear seatback, and a tilt (though not telescopic) steering wheel. Options include air conditioning, an upgraded 172-watt audio system with MP3 compatibility, iPod and USB inputs, and cruise control. The Washington Post reports that "all [Hyundai] Elantras have remote keyless entry and power windows," adding that "air conditioning, cruise control, and CD player are optional" for the Hyundai Elantra GLS but are "standard on SE." 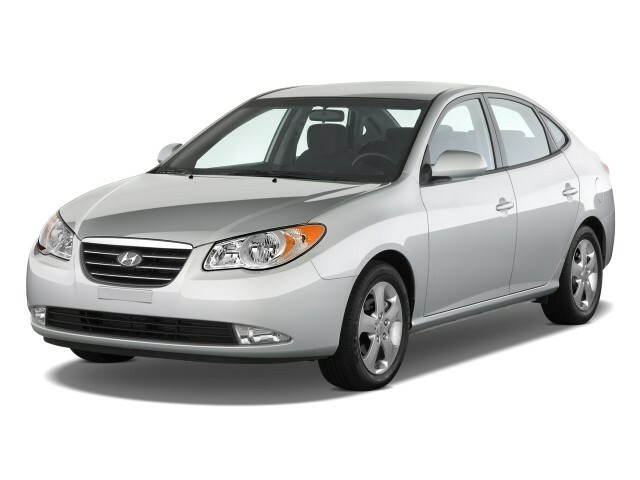 Cars.com is particularly enthusiastic about the 2009 Hyundai's "abundant convenience features, most of which are rarities at this price—things like lighted vanity mirrors, a telescoping steering wheel, a sunglass holder and a rear armrest with cup holders." The upgraded GLS adds most of those options plus a few more minor features, such as fog lamps, while the top-of-the-line SE includes steering-wheel audio controls, leather trim, telescopic steering-wheel adjustment, sport-tuned steering and suspension, and 16-inch alloy wheels. At the top of the range you can get a sunroof and heated seats. Bluetooth is offered only as a port-installed option, and it's a mediocre headliner-speaker system rather than integrated with the audio system. 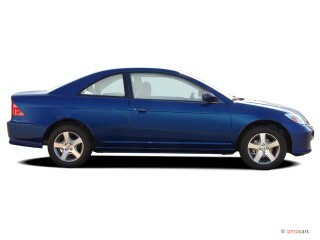 For a family of 4 it's a nice car..Drives well and rides nice.It is by no means a sport car.If your looking for a car with a lot of get up and go this may not be the one you want but if you want a good over... For a family of 4 it's a nice car..Drives well and rides nice.It is by no means a sport car.If your looking for a car with a lot of get up and go this may not be the one you want but if you want a good over all family car that gets 33mpg on the high way than it's worth looking at.I just got one a few days a go for what I needed it for it's a nice car. witch was a car that would drive and ride nice and get good mpg.Mine has 122k on it but you would never know it on how well the drive train works.Engine is very quiet and the transmisson shifts very nice there is also no clunk sounds coming from it.I only wish it came with blue tooth but happy with the sound system. Looking for a different year of the Hyundai Elantra?